Everlast Building & Repair is based in Yardley, PA and services residential and commercial clients in Lower Bucks County, Northeast Philadelphia, Montgomery County, Burlington County and Mercer County. Owner, Mike Moore, is a Master Carpenter with more than 15 years of experience prior to starting Everlast Building & Repair. In addition to his extensive construction experience, Mike studied business and accounting at Cornell University and Delaware Valley College. Mike is a former member of the United States Marine Corps Reserve and an All-American Wrestler. Mike employs only the best craftsman. His team consists of individuals who have developed strong skills and technical ability from years of construction and home repair experience. Mike Moore founded Everlast Construction & Repair as a true partner for local home owners and businesses. It’s not enough to have a company that can do the work. You need a partner that you can trust who will provide their experience and knowledge to assist you in the decision making process, craft a plan, and execute it with respect to your wishes and budget. 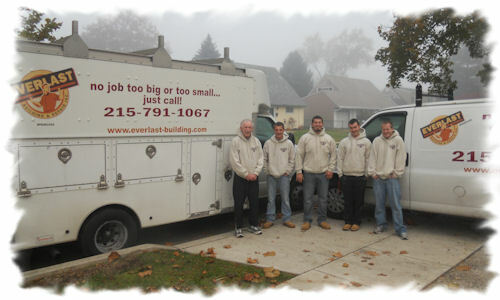 Everlast’s goal is to provide our customers with quality services and long-lasting craftsmanship. We want you to be completely satisfied! We are fully insured with liability insurance on your home and workers compensation insurance for our employees. We are committed to providing you with top of the line services and products at fair and reasonable prices. Contact us today to learn how we can make your project a success!